The University of Bradford Charter and Grant of Arms now have a new home in the J.B. Priestley Library, alongside our University “portrait gallery”. This image shows the University’s Coat of Arms, which includes the white rose of Yorkshire and the hunting horns from the tale of the Bradford Boar. 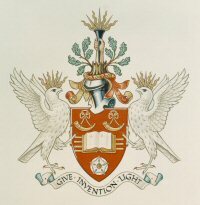 The motto “Give Invention Light” is from a Shakespearean sonnet, alluding to the extra “object” included in Bradford’s Charter: not only “the advancement of knowledge” but also “the application of knowledge to human welfare”, shown for example in the work of the Peace Studies Department and now in the “ecoversity” programme. The book, representing knowledge and university values. Plus sections of a globe, to represent the University’s international connections and its aim to expand knowledge to meet challenges of today’s and tomorrow’s worlds.